Our Funarena! : Why We Always Wait For A Tragedy! Why We Always Wait For A Tragedy! The Mangalore runway, called as table top one, was always fraught with danger. But nowhere nobody was concerned about that. One hundred fifty eight people had to die horribly to draw attention to this fact. 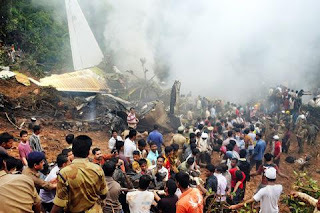 On 22nd May at 6.30 am the Dubai-Mangalore Air India Express Flight overshot the runway by 2000 feet and crashed into the gorges that surround the airstrip. Now only we know about. So many people including experts and air crew talked about the dangers of this table top runway. 'If offered no margin for error, the slightest mistake by pilots and hundreds of lives were always in danger.' Why no precautions were taken earlier to prevent this? Why do we wake up only after a tragedy of immense proportions happens? And after knowing it what is going to be done? Flights are still landing at and taking off from Mangalore airstrip. Do we need some more disasters? And, within three days of the accident, the Air India staff has gone on strike demanding more pay. SHAME! What's Wrong With Team India's Tactics? The Political Circus of a Strike!